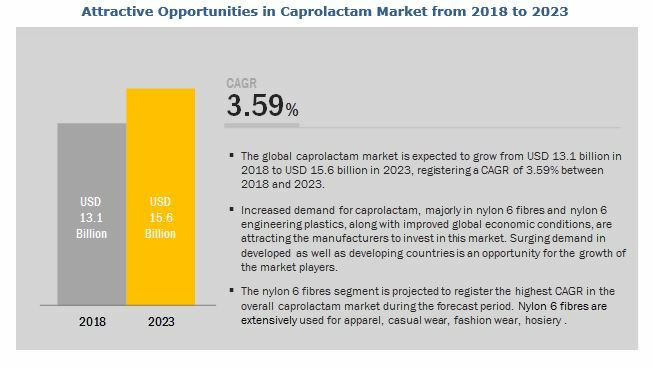 [197 Pages Report] The market for caprolactam is estimated to grow from USD 13.1 billion in 2018 to USD 15.6 billion by 2023, at a CAGR of 3.59% during the forecast period. Need for lightweight vehicles, the growth of films and coatings applications, and the growth of emerging economies are the major factors driving the caprolactam market. Caprolactam or ε-caprolactam is an organic compound and a colorless solid, which is a lactam or a cyclic amide of caproic acid with a melting point of 70°C (158˚F). ε-caprolactam is the only common caprolactam isomer, which is usually dropped. ε-caprolactam is soluble in water and also in most oxygenated and chlorinated solvents. It is primarily used in the production of nylon 6 fibers and resins. Around 68% of caprolactam is consumed in the production of nylon fibers in the textile industry, globally, for carpet and industrial yarns and is also used in engineering resins and films. The nylon/polyamide made from caprolactam is a high-performance plastic and is widely replacing metal-based applications due to its properties such as impact, high temperature, and abrasion resistance; excellent balance of strength, and resistance to bases. It is a multi-characteristic nylon for industries such as automotive, consumer goods, electrical & electronics, textile, and packaging. 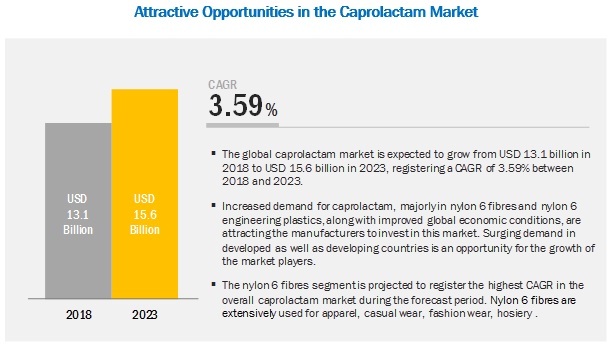 The nylon 6 fibers segment is expected to account for the larger share of the caprolactam market. The nylon 6 fibers segment is the largest and fastest-growing application of caprolactam. Caprolactam is used widely in polyamide 6 for manufacturing washable domestic textiles. Polyamide 6 fabrics are dimensionally stable and smooth. The applications of polyamide 6 in the textile industry are classified into apparel, home furnishings, and industrial. Polyamide fabrics have properties such as high elasticity and resistance to mildew and moths. Due to these properties, they are used in nets, stockings, female underclothes, parachutes, and sporting garments, thereby, driving the demand for caprolactam. APAC is expected to account for the largest market share during the forecast period. APAC has emerged as the leading consumer and producer of caprolactam. The APAC region is witnessing increased demand for luxury cars due to the increase in purchasing power of consumers. This has led to increased polyamide 6 demand in the region, which, in turn, is driving the nylon 6 engineering plastics segment. Prices for caprolactam are expected to rise in the APAC region due to anti-dumping sanctions imposed by the Government of China. These factors are further driving the demand for caprolactam in the region. The major players in the caprolactam market are AdvanSix Inc. (US), Alpek S.A.B. de C.V. (Mexico), The Aquafil Group (Italy), BASF SE (Germany), Capro Co. (South Korea), China Petrochemical Development Corporation (Taiwan), Domo Chemicals (Germany), Grupa Azoty (Poland), Gujarat State Fertilizers & Chemicals Limited (India), Highsun Group (China), KuibyshevAzot PJSC (Russia), Lanxess AG (Germany), Luxi Chemical Group Co., Ltd. (China), China Petroleum & Chemical Corporation (Sinopec) (China), Spolana (Czech Republic), Sumitomo Chemical Co., Ltd. (Japan), Toray Industries, Inc. (Japan), Ube Industries, Ltd. (Japan), and Zhejiang Hengyi Group Co., Ltd. (China). In May 2018, Aquafil and Genomatica announced the formation of Project EFFECTIVE, a multi-company collaboration to produce more sustainable fibers and plastics for commercial use by using renewable feedstocks and bio-based technologies. One of the key objectives of Project EFFECTIVE is to develop a more sustainable nylon, made from bio-based caprolactam produced using renewable feedstocks. In February 2018, Aquafil signed an agreement with INVISTA, one of the world’s largest integrated producers of chemical intermediates, polymers, and fibers, to acquire certain tangible and intangible assets related to INVISTA’s nylon 6 business activity in APAC. This will accelerate Aquafil’s investment program in APAC, which has the highest potential, in terms of demand growth for synthetic fibers. In April 2017, Lanxess expanded its production capacity for polyamide and precursors for plastics in Lillo-Antwerp (Belgium) in order to strengthen the competitiveness of this site. Caprolactam is a key precursor for the production of high-tech plastics and used in the automotive and electrical & electronics industries. What are the mid- to long-term impacts of the developments undertaken by the key players of the market? Which applications will emerge as major consumers of caprolactam in the next five years? What are the upcoming applications of caprolactam? What will be the future of the caprolactam market? How will the manufacturers expand and extend their caprolactam product portfolio to cater to the applications? 11.2 Alpek S.A.B. De C.V.
11.9 Sumitomo Chemical Co., Ltd.
11.17 Luxi Chemical Group Co., Ltd.
11.19 Zhejiang Hengyi Group Co., Ltd. The study involved four major activities in estimating the current market size for caprolactam. Exhaustive secondary research was done to collect information on the market, the peer market, and the parent market. The next step was to validate these findings, assumptions, and sizing with industry experts across the value chain through primary research. Both top-down and bottom-up approaches were employed to estimate the complete market size. Thereafter, market breakdown and data triangulation were used to estimate the market size of the segments and the subsegments. In the secondary research process, various secondary sources such as Hoovers, Bloomberg BusinessWeek were referred to for identifying and collecting information for this study. These secondary sources included annual reports, press releases & investor presentations of companies; white papers; certified publications; articles by recognized authors; gold standard & silver standard websites; regulatory bodies; trade directories; and databases. After arriving at the overall market size—using the market size estimation processes as explained above—the market was split into several segments and subsegments. In order to complete the overall market engineering process and arrive at the exact statistics of each market segment and subsegment, the data triangulation and market breakdown procedures were employed, wherever applicable. The data was triangulated by studying various factors and trends from both the demand and supply sides of the nylon 6 fibers, nylon 6 engineering plastics, films, and others. This research report categorizes the caprolactam market based on application and region.